Because of the miracle of the oil, it’s a Jewish tradition to eat fried foods on Hanukkah. The best beloved of these foods among North American Jews is the potato pancake, called a latke. 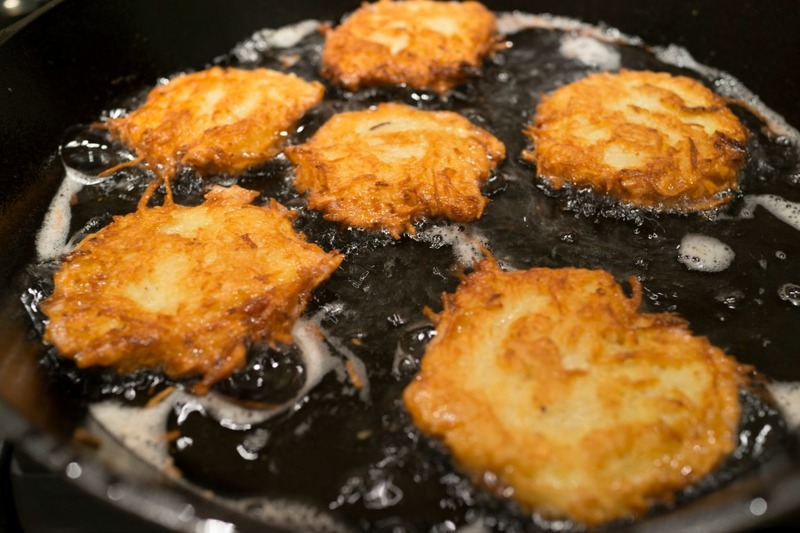 We at InterfaithFamily.com are not culinary purists who insist that latkes must only be made of grated potatoes, eggs and onions and fried in lots of oil. It’s fine with us if you try baking them on a non-stick pan, making them out of zucchini and sweet potatoes or making them vegan and adding grated beets. You can find many variations and there is no reason not to enjoy them all. 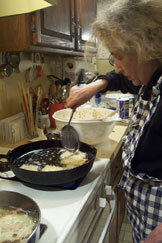 For a classic version of the traditional latke recipe, click here. Or here. Watch our video here on how to make them! You can buy a mix to make latkes or get frozen pre-made latkes. Nothing bad will happen if you don’t make them from scratch. It is good to keep in mind that if your relatives keep kosher, you shouldn’t serve the latkes with sour cream at a meat meal, because people who keep kosher don’t mix dairy ingredients and meat ingredients in the same meal. You can serve them with applesauce at a kosher meat meal; that’s a traditional topping. Rumor has it they are good with other, less traditional toppings, like cranberry sauce, salsa or lingonberry preserves. Enjoy yourself and make it your own. Jews whose families didn’t come from Eastern Europe eat other fried goodies on Hanukkah. According to Claudia Roden, author of The Book of Jewish Food, among Sephardim it was the custom to have fritters in syrup called bimuelos or zalabia. In Israel, Ashkenazi and Sephardi traditions blended to form the custom of eating jelly doughnuts, sufganiot, on Hanukkah. There’s nothing symbolically significant about the jelly in the doughnut–for whatever reason, Israelis like jelly. Another thing that North American Jews eat at Hanukkah is chocolate Hanukkah gelt. These are the chocolate coins wrapped in gold or silver foil that you can use for gambling when you play your dreidel game. They are also fun for children who like to play pirate treasure. You can see InterfaithFamily.com’s full Hanukkah Recipe Index for more great foods.